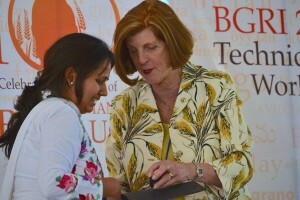 At the Borlaug Global Rust Initiative (BGRI) 2014 Technical Workshop in Obregón, Mexico, Dr. Chhavi Tiwari received the ‘Women in Triticum Award 2014.’ Tiwari was a recipient of the CIMMYT-CSISA Research Fellowship in 2010 and has been actively engaged in wheat research for the past nine years, targeting the crucial wheat concerns of the Eastern Gangetic Plains of India, particularly the heat stress and micronutrient deficiency in the region. Dr. Chhavi Tiwari receives Women in Triticum award from Dr. Jeanie Borlaug Laube. Pleased with this opportunity, Tiwari feels it will help her to “contribute to enhanced wheat production and improve the socio-economic status of resource poor farmers.” Chhavi received her Ph.D. (Agriculture) in Genetics and Plant Breeding from Banaras Hindu University (BHU) in 2012. Currently she is working as a Research Associate in the HarvestPlus Wheat project at BHU, India. Tiwari said that the CSISA Fellowship and guidance from CIMMYT scientist Dr. Arun Joshi during her PhD helped her to find pragmatic solutions for heat stress in wheat in South Asia. It also provided her with a platform to travel and meet with international scientists and helped to improve her research knowledge base.